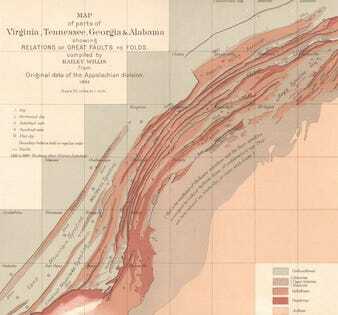 The story of the Appalachians began almost half a billion years ago. The first British colonialists arrived in North America just 400 years ago. Yet both events are connected and shaped the history of the modern United States. Without a series of mountain building cycles 65 to 490 million years ago caused by the assembling and breakup of the supercontinent Pangaea, it’s possible that today we would see the United States of Canada having a border to the south with the Spanish-American Empire. The first British colonists arrived to America in 1607 and were confined by mountains to the coastal plains bordering the Atlantic. The north-south trending ridges of the Appalachians, spanning 1,500 miles from Nova Scotia to Alabama, were a difficult terrain not suited for permanent settlements and of no use to the first European farmers. The rugged Appalachians began forming some 470 million years ago when the ancient continents of Laurasia (comprising the North American plate) and Gondwana (comprising South America and Africa) collided, forming the supercontinent named Pangaea. In this process, the Iapetus Ocean (located between the two land masses) closed and parts of the oceanic crust were pushed under the North American plate, partially melting. The thick successions of sediments, spanning from 470 to 570 million years in age, of the Iapetus Ocean were folded, tilted and stacked above each other during the slow closing of the oceanic basin. The partially molten oceanic crust formed large granitic intrusions and fed ancient volcanoes. Some 380 million years ago, the ocean was completely closed and the sedimentary and volcanic rocks were pushed upwards and the primordial first Appalachians mountains formed. Sixty-five to 220 million years ago, Pangaea started to break apart and a new ocean (the Atlantic) started to form. The Appalachians were pushed away from the most tectonically active area, and without tectonic movements from below, erosion started slowly to wear the mountains down. Today the highest peak in the Appalachians is the 6,680 ft summit of Mount Mitchell in North Carolina, half the height of average peaks in the Rocky Mountains. However, the succession of soft sedimentary rocks and hard volcanic rocks forms a series of parallel ridges and tectonic fractures and the tectonic movements of two large mountain building cycles fractured and tilted the rocks, causing a rocky and rough terrain. So only the French, settling in the northern territories (later to become Canada), claimed parts of the Appalachians by establishing a network of outposts for trading fur in the wilderness. In the south, the peninsula of Florida and the Great Plains were claimed by Spanish settlers, establishing the colony of New Spain. It seemed that the British colonists were surrounded by both natural and political opponents. However, that isolation soon provided decisive. The plains in the Great Appalachian Valley in eastern Pennsylvania provided fertile grounds and the population of the British colonies grow over time, unnoticed by the French and Spanish authorities. Soon those colonists expanded westwards in search of new land. This led to a conflict between England and France above the control of the few gaps and mountain passes in the Appalachians. The English colonists were far more numerous and better supplied than the French, having direct access to the sea. The rugged, poorly accessible terrain of the Appalachians proved to be difficult for the French and allied Indians to defend, and were eventually lost to the expanding British colonies. After the end of the French-American War, the English crown wanted to limit new settlements to the area of the Appalachians, hoping to avoid further conflicts with the remaining French and Spanish forces. However, the unexpected result of this political move was resentment among the American colonies. The colonists became convinced that the crown didn’t care for the political future of the successful expanding colonies. Among other factors, this resentment would contribute to the later Revolutionary War, leading in the end to the foundation of the United States of America. All thanks to some tectonic movement hundreds of millions of years before.